<?xml:namespace prefix = v ns = "urn:schemas-microsoft-com:vml" /><?xml:namespace prefix = w ns = "urn:schemas-microsoft-com:office:word" />The history of Bluefield begins in the 1700s, whesettled in a rugged and remote part n two families of what is now southern West Virginia, and built a small village with a mill, a church, a one-room schoolhouse, and a fort for defending the small settlement against invasions by the much larger Shawnee Indian tribe on the banks of the Bluestone River. The Davidson and Bailey family had to sell a portion of their land when in 1882, Captain John Fields, of the Norfolk and Western Railroad pioneered the area and began building a new railroad through the hills of Bluefield (named after the chicory flowers in the area that painted the landscape a purplish blue hue during the summer) and nearby Harman, Virginia. Underneath the feet of the Davidsons and Baileys lies the largest and richest deposit of bituminous coal in the world - the soft burning coal which was ripe for fueling the industrial machines of the developing world. The first seam was discovered in nearby Pocahontas, Virginia, in the backyard of Jordan Nelson, which was, in the words of President Frederick Kimball of the Norfolk and Western Company, the "most spectacular find on the continent and indeed perhaps of the entire planet." The seam is mentioned in Thomas Jefferson's "Notes on the State of Virginia," but it was not mined until 1890. Around that time, the coal mines that soon opened up in the area, around Harman, Bluefield, War, and Pocahontas, were known as the Pocahontas coal fields; they helped to drive the entire Industrial Revolution in the United States and to fuel the US and British Navies during both World Wars. The herculean effort to extract the coal from the mountains created a vast civilization, bringing emigrant European workers to the mountains in search of work, so literally overnight, a metropolis was born. Today's Bluefield does not resemble the Bluefield of long past because today's it is a sleepy town, almost a ghost town compared to the hustle and bustle of the years from 1890 to 1960, the coal rush years. So-called "Summit City", because of its high elevation, and its naturally sloping divides in the coal yards, Bluefield became one of the first cities in the world to have a noticeable skyline - with high rises that were only comparable to New York and Chicago in their day. Today, those high rises remain, but they are nowhere near the heights which are common in many modern American cities today. The city's growth was phenomenal. In a one year period from 1887 to 1888, passenger travel along the railroad escalated an astonishing 317%. Like San Francisco of the gold rush period in California, Bluefield became a city that sprung up overnight, and it far outpaced the infrastructure available to it at the time. Urban sprawl and blight were common complaints in the early days. Unfortunately, Bluefield was not a city that had control over its own destiny. That rested entirely with the giant Norfolk and Western Railroad, and it depended on the whims of the international market. 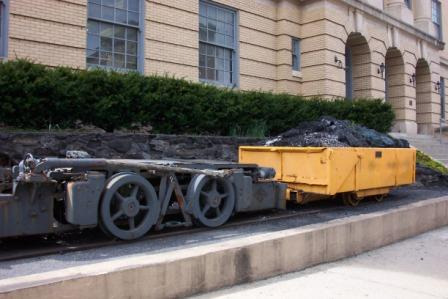 When coal tonnage was good and the market for coal was booming, Bluefield was literally a "Little New York" as it was called in the day. A bustling metropolis, it had nightlife and a personality that was a little bit Chicago, a little bit New York, and a whole lot of Pittsburgh - rugged and with steel and coal embedded in its soul. In 1889, the city of Bluefield, West Virginia was officially incorporated. The city government was always known in those days as being corrupt, inefficient, and was quite a scandalous affair, with drunken brawls and fights breaking out on the floor of City Hall on an almost daily basis. With a strong ethnic community, Bluefield was the site of the 1895 founding of the Bluefield Colored Institute, the nation's first college with primarily black students. That college is today's Bluefield State College, and the site of a November 21, 1968 terrorist bombing. The coal boom fueled a wave of money into the area, and nearby Bramwell, incorporated in 1888, boasted itself as the Millionaires' Town because more millionaires per capita lived there than anywhere else in the nation. The city also had more automobiles per capita than any other city in the country at the time, which meant that in the early days, Bluefield knew more than any other city could ever want to know about the five o'clock traffic jam. They had them even before New York. During the 1920s, the most impressive high rise in Bluefield history was built, the twelve story opulent West Virginian Hotel, now the West Virginia Manor and Retirement Home. It was one of the first "skyscrapers" in the area and one of the tallest buildings in the world at the time. In 1924, nearby Harman, Virginia decided to rename itself Bluefield, Virginia to try and cash in on the opulent growth of its West Virginia neighbor. Additionally, Nobel-prize-winning economist and mathematician John Forbes Nash was born in Bluefield in 1928. The importance of the city was so great that Adolf Hitler even put Bluefield on its reputed list of German air raid targets in the United States. Air raid practice drills were common in the city during this time, as anyone living from those days can clearly recall. Ironically, the worst thing to happen to Bluefield was the interstate road system, which finally punched through East River Mountain in the 1960s and for the first time allowed automobile traffic to pass through the city without crossing the top of the mountain. The dependence on railroad traffic waned and the city began to shrink in population and eventually lost its Amtrak station in the 1980s. As the importance of the railroad continued to decline, the city shriveled to a much smaller version of its prior glory.